Glycemic Load - Use it to lose weight safely and permanently. The glycemic load is the measure of a given food on blood glucose levels once the quantity of carbs (grams) in that food has also been factored into the assessment. It gives you a more precise and accurate picture of how food affects your glucose levels. GI of 55 is low; GL of 10 is low. This is important because there are some fruits and vegetables with a high glycemic index that have a low glycemic load because they don't contain starchy carbohydrates. An example is the carrot. The carb content in a single raw carrot is 11 grams. The glycemic index is 35 so the GL using the formula above is 3.8 which is quite low. Carrots are extremely nutritious and full of antioxidants. If you juice three carrots you have 33 grams of carbs and the GL is 11.5 which is just a little over the low GL of 10 so it's still reasonable. The health benefits of carrot juice are well worth it. Another example would be a thick slice of pineapple. Pineapple has a moderate GI of 66 but a slice of fresh pineapple has only 10 grams of carbs so the GL is 6.6 which is low. Pineapple is a wonderfully nutritious snack and one slice will probably not raise your blood sugar. If you have high blood sugar it's probably best to eat only a single serving of fresh pineapple. The glycemic load considers the stress on your pancreas from the amount of the carbohydrate in the food. The GL, as it is sometimes called, is caused by eating too many carbs at once. This turns off the hormonal process that converts stored fat to energy. It can remain turned off for several hours after you have eaten which creates low energy and that sluggish feeling that is caused by an abnormal insulin response. If you are eating mainly low glycemic foods with a GL of 10 or under this will not happen. 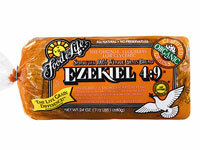 A good example of eating too much of a good thing would be Ezekiel bread made by Food for Life. This is an excellent high fiber bread that is made from sprouted grains. According to the company's online information, maltose, (the grain sugar produced during the sprouting process) is the slowest absorbing sugar in the human body. Obviously, it's a good choice for your bread. Eating one slice for breakfast would be perfectly fine. The GL for one slice is approximately 8 which is low and the glycemic index is roughly 45. However, it has 18 grams of carb per slice so if you eat two slices that's a GL of about 16. This is fine for a lunch sandwich but you wouldn't want that many carbs for dinner. Again, moderation is important. Starchy foods like breads and crackers are carbohydrate dense so it's best to stick to the low glycemic ones and to limit your portions. There are many fruits and vegetables with a high glycemic index yet they contain so few carbs you don't need to avoid them. Watermelon, pineapple, the winter squashes, carrots, all fall into this category. It's always better to eat the whole food. Fruit juices will raise your blood sugar. Most vegetables are low glycemic and very alkaline and juicing them is a great way to get more enzymes, vitamins and minerals. Drinking fresh vegetable juice on a daily or at least weekly basis is probably the single most important thing you can do for your health and to lose weight! Understanding the concept of the glycemic load frees us to be able to eat more foods that may have a high glycemic index (vegetables and fruits only) but so few carbs per serving that they will likely not raise your blood sugar if you eat them in moderation. It's not really necessary to get the GL calculations if you are trying to lose fat or just eat in a healthy way. As long as you pay careful attention to whether or not the food is carbohydrate dense (starchy) or sweet and you are familiar with the low and high glycemic food lists you can follow a low glycemic plan. Pay attention to serving sizes and limit your high carb density foods even if they're low glycemic, especially in the evening. There are some glycemic researchers like the University of Sydney, S. Australia, publishing the GL, glycemic load, of a given food as well as the the GI, glycemic index. Please refer to Resources to find these indices from the research institutes themselves. Return from Glycemic Load to Glycemic Index. Return from Glycemic Load to Lifetime Fat Loss home page.